Sunny Morocco seems like the ideal place to produce solar power. Just north of Marrakech lies the Green Energy Park, where researchers are working on making green energy technology more affordable, as part of Morocco’s drive to reduce energy dependency. Euronews’ Denis Loctier visited their concentrated solar power (CSP) plant, where he spoke to the coordinator of the EU-funded project, MinWaterCSP, Falk Mohasseb. “The big advantage of CSP technology is that the source – the sun – is free. Another advantage is that it is relatively compact, and it is also quite an efficient system, compared to rival technologies like photovoltaic panels, for example,” he said. But mirrors are difficult to keep clean in hot climates. The wind carries dust from nearby deserts, and washing it off uses up precious water resources. So scientists are looking for ways to reduce the use of water by measuring the reflectivity of the mirrors to determine the most water-efficient cleaning schedule. Large amounts of water are also used for cooling purposes, so researchers are looking into hybrid cooling systems that can use air instead of water when the temperature is low enough. Another problem is the accumulation of salt on the tubes, which affects the performance of the power plant. “It’s a problem that depends on the quality of the water. 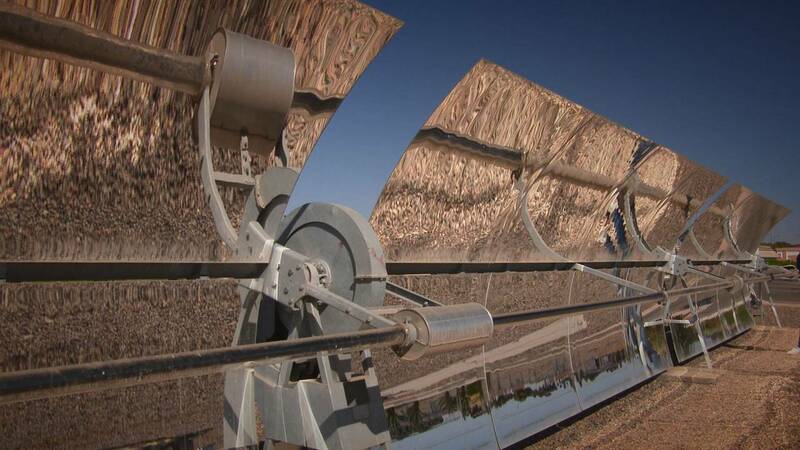 In the end, it makes the condensers and therefore the power plant less efficient, by obstructing thermal exchange between the tube and the water used for cooling,” said El Ghali Bennouna, researcher in solar thermal systems at IRESEN. To find out which chemicals worst affect the cooling systems, researchers in their lab add different salts to the cooling system and run it round the clock. The results will reveal which chemicals need to be removed to stop the salt from accumulating – a process known as salt fouling. “We may not stop the fouling completely, but if we reduce it, the heat exchange will improve and that will of course give us optimal cooling,” said Afaf Zaza, a PhD student in heat exchangers at IRESEN. It’s hoped the research will lead to significant water savings. Cooling systems could, for instance, use recycled water from other industrial processes. The ultimate goal being to make CSP plants more competitive, and help promote this environmentally-friendly technology in regions that are heavily dependent on affordable fossil fuels. According to the researchers, technological improvements could eventually save up to 25% of the water currently used for cleaning the mirrors, and up to 95% of what’s lost to evaporation in the cooling systems.